I'm trying to decide if I want balanced or RCA cables between the amp and preamp. I have my gear on a audio bench. So the amp and preamp sit side by side about two inches apart with monoprice balanced cables, but now I am in the market for better cables. What would the benefit of balanced cables be? It not like its a long run. And I doubt if there would be any audible difference between balanced and RCA. Do I have the right idea hear? If the power and pre are true balanced circuitry there may possibly be some sonic difference. There will be about a 6 dB more gain using the balanced connections could be one benefit. On the other hand you usually pay more for XLR's. The bad thing about trying to compare XLR to RCA is getting cables close enough matched to compare apples to apples. My Transparent XLR's sounded better than my RCA when comparing between Krell CDP and integrated but the XLR's cost nearly twice as much, they didn't make entry level XLR's, or if this was the entry, it was expensive. Next time we get together I'll let you borrow mine to try. Or, we can see if you can borrow either Tributaries or Transparent from the shop. The best connection I ever had between those Krell units was a set of DIY Hermanv built and sent to me to try. Not better than my Siltech on CJ but they were magic to the Krell, I didn't want to give them back. All of this to say, you are probably right that it may not make a great deal of diference. Except for that 6dB of gain via XLR, that may be worth using them if the cost wasn't much out of line. I agree with Mr P. In general balanced is not preferred for short runs between equipment that is not fully balanced. If you component is not inherently a balanced circuit, extra circuitry is need to provide either a balanced output or balanced input as the case may be. Superfluous circuitry rarely does any good, so just use single-ended I/Cs. I doubt if the Rotel is truly balanced. 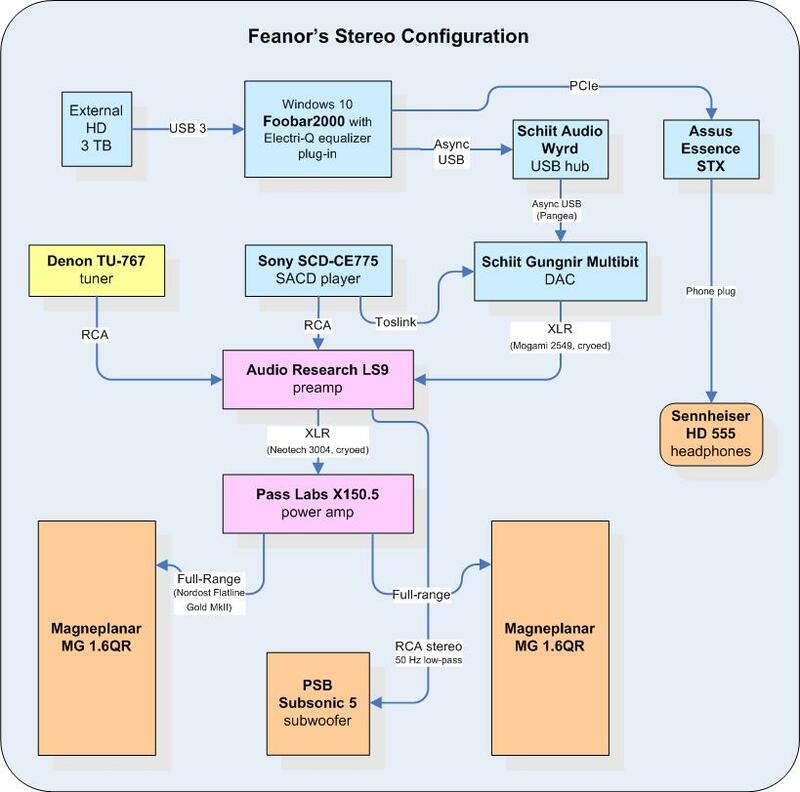 I was doing some reading from Kal Rubinson of stereophile Mag over at Club Rotel and he seems to think there is still some benefit in using balanced connections when its not truly balanced. He says its not all for show. But anyway do you have any information on these cables? I really like the Analysis Plus. They are the front runner with me. The Oval One Interconnects would be the ones I get. Im going to try to go and listen to these...I think there is a dealer who sells them local. I also may have a dealer here who sells the straight wire. I like the Rhapsody S series. The River cable I only have on-line reviews. I like the AudiFlex Gold Plus Analog Cables. Which ever cable I go with, I will use it for all my interconnects and speaker wire. I was speaking to a friend who also seems to think Vampire wire is also a very good cable. If you have a long run of cable or if your environment has a lot of RFI/EMI, then balanced cables will help significantly by nulling out any of the noise captured by the cable between source and target. This why almost all professional equipment uses balance connections. Note that having an XLR connector doesn't in itself quarantee the component has a balanced input/output. In some cases the '-' connector is simply routed to ground and does nothing. If you want an actual balanced connection, if your component is inherently single-ended, if it's the source, it will need circuitry to generate the two, +/- balanced signals. If it's the target it will need circuitry to combine them. However you will get the benefit of cancelation of noise, thus extra circuitry can be worth it if you have conditions as described in the first paragraph. I haven't tried them but I've heard Straight Wire isn't so hot. I'm not familiar with Vampire. When taking into consideration some one's recommendation on what is a "good cable" you have to ask what have they compared it to. If Vampire has been compared to other name brands and it is preferred then the rec should be worth consideration. But if it's the only thing they've used since replacing the stock how could they know what good is. Well I ordered the Analysis Plus cable and it should be here Monday or Tuesday. I got a real deal on the cable. After I break them in for a while, Mr.Peabody and I will shoot-out them with his BJC, Audio Note, and Transparent cable and maybe his Siltech cables...should be fun. Good deal Frenchie. Was the improvement as huge as when we switched out to the BJC? I know that may be a difficult call since time has past. Yes it was...The sound stage is even bigger. I ordered 3 pair of the inner-connect cables. one set 1/2 meter and 2 sets 1 meter. I had a very nice conversation with Wylie about audio. I listen to his system. It was great. He has a Vincent CDP with a tube output stage. He drove it and the Galo speakers with a Parasound amp and preamp It sounded great. He also had Analysis Plus Oval 12 speaker cables connected to the Galo's and they two have a warm smooth sound. I think I found a deal on a set. Cant wait to get them. Wiley has a lots of gear over there and he seems to be very much in business with audio out of his home. Im taking some Paradigm's SE mini's over there to get re foamed. I bet that was a big improvement to get those Monoprice out from between the amp and preamp. Are you going for the speaker cable next?